Hold down “alarm key” to adjust alarm time with use of “+” and “-” keys. Then press “alarm key” to confirm.Then select your desired natural sound among the 5 types of natural sound with use of “+” and “-“ keys. Then press “alarm key” to confirm. The alarm icon is appeared on the screen and the alarm setting is completed and ready. 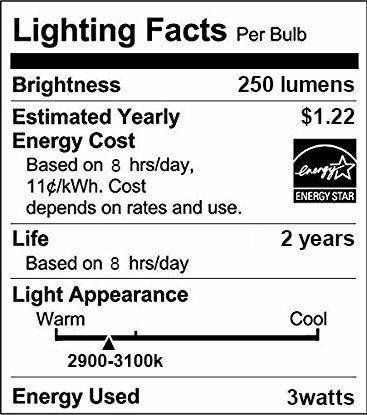 The light will turn on automatically before 30 minutes of alarm time, and slowly brighten up with 20 levels of brightness. The brightness will reach the maximum at the alarm time while the natural sound start to ring. The natural sound alarm will be off automatically after 5 minutes ringing. The light will be off 10 minutes after alarm clock stops ringing. ▲ The alarm function will repeat every next day. 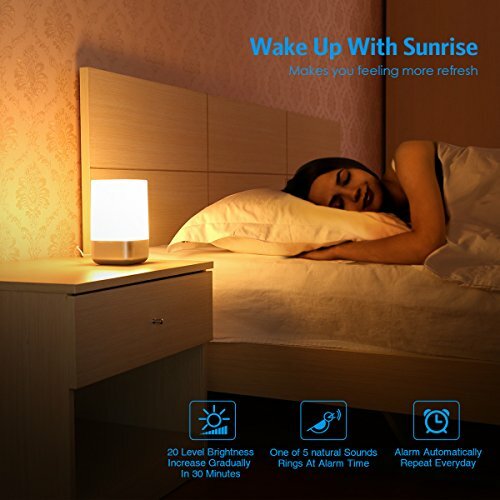 ▲ If you need to set the clock in less than 30 minutes, the Sunrise Simulation wake-up light will not work, but the natural sound alarm will still be on at the preset alarm time. 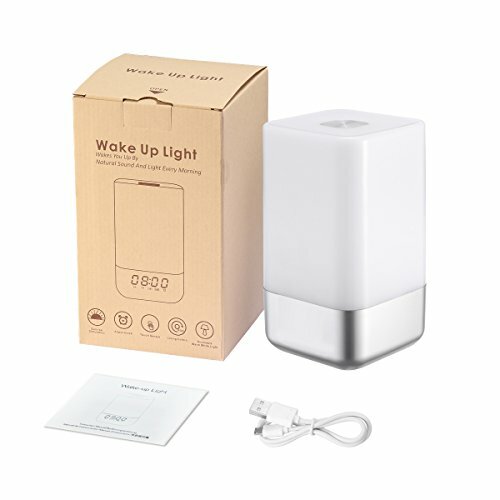 Sunrise Simulation - This wake up light with sunrise simulation. 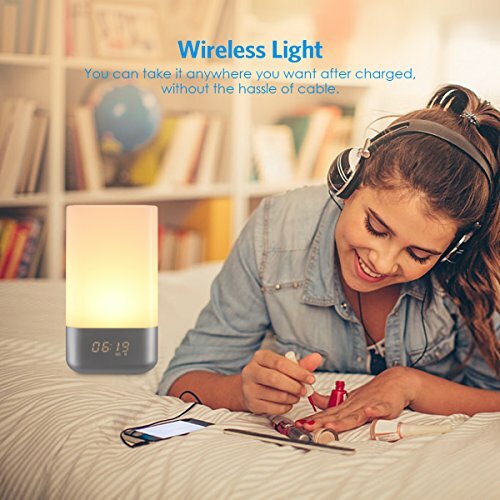 30 minutes before the alarm clock rings, the light will turn on automatically, and slowly brighten up with 20 levels of brightness, wakes you up naturally and comfortably. 5 Natural Sound - 5 natural sounds, such as thrush singing, kingfisher singing, cuckoo singing, waves and thunderstorm, which will wake you up by a gradually increased gentle sound rather than sharp tones. Make sure you have a good mood to prepare for a new day. 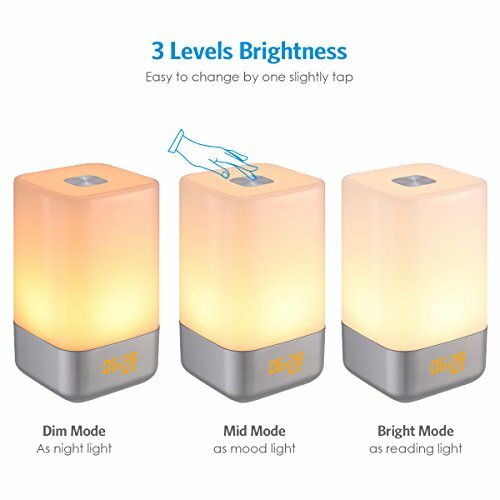 3 Brightness Modes - 3 warm-white light modes for reading light, night light and normal light, just one gently tap, you can power on/off, switch brightness mode and change colors as you like. 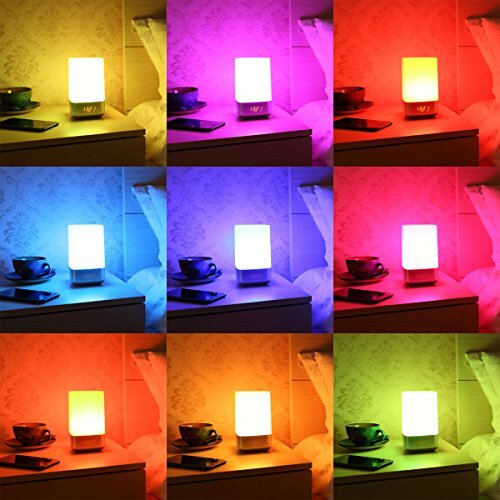 Color Changing Modes - 256 RGB colors change automatically or you can fix a color as you desired to meet your current atmosphere. 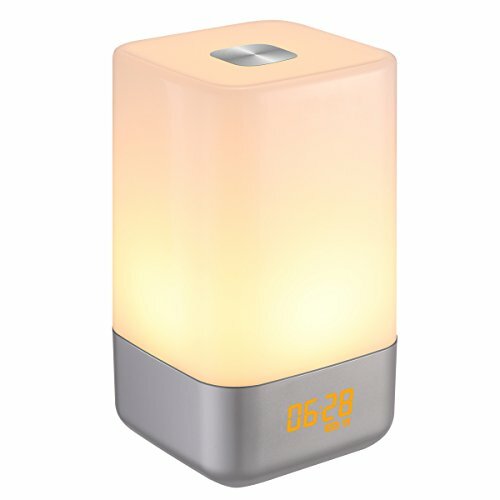 Rechargeable Emergency Lighting: With 3600 mAh built-in rechargeable lithium battery. Connect the product to 5V wall USB adapter (NOT INCLUDED) using enclosed micro USB cable. 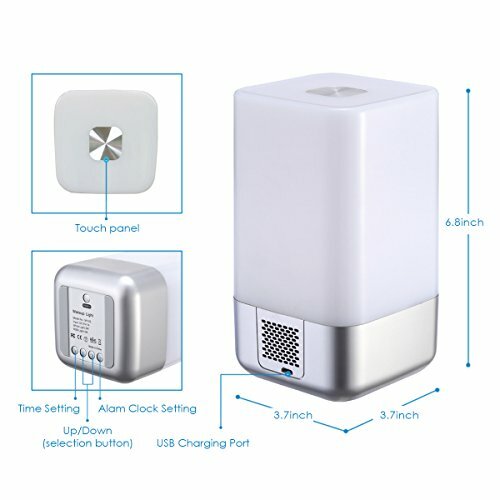 It could also be connected with USB port on your computer/TV, power bank, or other USB power source.